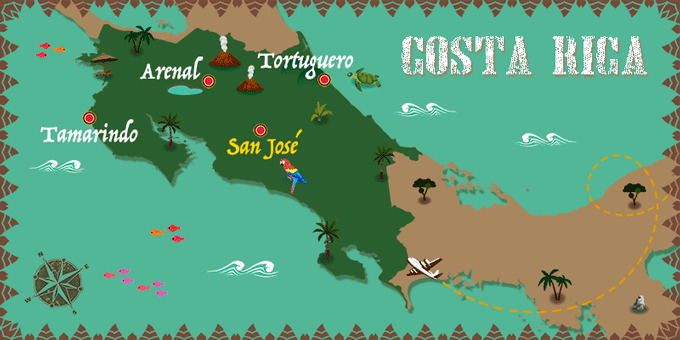 Explore the stunning biodiversity of Costa Rica and discover the ideal combination of adventure and relaxation. Stroll through the capital San José, sail through canals of Tortuguero and feel the power of the majestic Arenal Volcano. Immerse yourself in the cloud forest of Monteverde and fall in love with the immense sunsets on idyllic tropical beaches bathed by the Guanacaste sun in Tamarindo. ** The transfer times may vary depending on the schedule. Our agent in San Jose will issue all your documentation on arrival. Entrances, departure tax, drinks, tips and any other services not mentioned in what's included. In Tortuguero, tickets to the Turtle Museum (£2) and the National Park ($15) are not included. Arrive at your UK departure airport to board a flight to San José. Arrival in the capital of Costa Rica and transfer to your hotel. Overnight stay in San José. Set off early in the morning to Guápiles de Limón and upon arrival enjoy a typical Costa Rican breakfast. Visit a local butterfly farm before heading to La Pavona port to board a boat to take you to your lodge in the heart of Tortuguero. On arrival, enjoy a welcome cocktail and lunch in the main restaurant. In the afternoon, visit the picturesque village of Tortuguero, located on an island between the sea and the lagoons, to visit the Turtle Museum*, designed to educate visitors about the protection of turtles, and their habitat, nesting and spawning behaviour. Dinner and overnight stay in Tortuguero. * Cost of the entrance to the Turtle Museum: £2 per person. Full-Board. Today, enjoy an excursion into the Tortuguero National Park, admiring the natural environment teeming with the most varied fauna and flora in the country. Be sure to look out for the indigenous wildlife such as manatees, jaguars, otters, sloth monkeys, crocodiles, basilisk lizards and hundreds of species of birds. Take a nature hike to experience the splendour of the natural environment up-close. Return to the hotel for an overnight stay in Tortuguero. * £15 entrance fee to pay locally at the Tortuguero National Park. Breakfast at the hotel. Set off from the lodge to the pier for a boat ride to the north of the country towards Guapiles, the gateway to the Costa Rican Caribbean. Lunch. Next, transfer to La Fortuna area of San Carlos, where the Arenal Volcano is located, one of the most important and spectacular in Costa Rica. Arrival to Arenal and rest of the day free. Overnight stay in Arenal. * Thermal Hot Springs in Tabacón: Enjoy one of the main natural wonders of the country with waterfalls that form natural pools whose thermal waters emerge directly from the impressive and active Arenal Volcano. Dinner included. Price per person: £98. Breakfast at the hotel. Transfer to Tamarindo, in the province of Guanacaste, known for its beautiful beaches and surfing. Arrive at the hotel and begin to enjoy your stay surrounded by idyllic beaches, bathed in Guanacaste sunshine. Overnight stay in Tamarindo. *Optional Catamaran Tour: Set off in the morning on a relaxing catamaran tour. The route is the same as the afternoon but with much less boat traffic. Look out for marine life such as whales, dolphins and rays, and enjoy snorkelling in the clear waters. Buffet brunch included. Price per person: £74. Breakfast at the hotel. Transfer back to the capital, to spend your last night in San José. We suggest taking a stroll through this beautiful city, visiting the National Theatre of Costa Rica or enjoying a delicious dinner at a local restaurant. For a great overview of the city, we recommend an optional city tour of San Jose. * Overnight stay in San José. * Optional San Jose City Tour: Visit the most prominent sights of the city such as the National Theater, the Art Museum, the Metropolitan Cathedral and the charming Central Market, among other places. Traditional dinner included. Price per person: £55. Breakfast at the hotel. Free day. At the indicated time, transfer to the airport to board your flight back to the UK. Night on board. Breakfast at the hotel. Free day to enjoy the tranquillity of this beautiful natural environment. We recommend the optional horseback ride to the Fortuna Waterfalls for a unique view of the rainforest. * Overnight stay in Arenal. Breakfast at the hotel. Take a shared transfer to Monteverde, including a boat ride on picturesque Lake Arenal. Arrive in Monteverde, whose natural reserve houses one of the most diverse and rich cloud forests in the world and has extensive trails that allow visitors to appreciate the great diversity of flora and fauna. Free afternoon at your leisure. We recommend an optional canopy tour to enjoy the beautiful Costa Rican landscape from above. * Accommodation. * Optional Canopy Tour: Explore the canopy on one of the longest cables in the country and cross suspension bridges and zip lines of more than 900 feet high, from where you can explore the treetops and the wide biological diversity of the rainforest. We recommend wearing long trousers, a light jacket and comfortable shoes. Price per person: £40. Breakfast at the hotel. Today, set off on an excursion to the cloud forest of Monteverde. Meet your guide who will accompany you during the tour as you discover the most interesting animals and plants that live in the lush forests. Take a 3km long route which consists of a combination of paths and 8 bridges, where you can explore the different layers of the cloud forest as well as the inhabitants of each of them from the ground up to the treetops. Spend the rest of the day at your leisure. Overnight stay in Monteverde. Breakfast at the hotel. Take a free day to discover the cloud forest and its flora and fauna on your own. We recommend an optional excursion to the Monteverde Reserve, for those who are looking to enjoy the beautiful scenery of Costa Rica and learn more about its biodiversity. * Overnight stay in Monteverde. * Optional Excursion to the Monteverde Reserve: Monteverde plays hot the most diverse and rich cloud forests in the world and has extensive trails that allow visitors to enjoy the great diversity of flora fauna. Enjoy a nature walk where you have the opportunity to observe jaguars, insects, butterflies and birds, including the rare quetzal. Price per person: £58. Breakfast at the hotel. Free day. We recommend an adventurous canopy exploration or water sports such as surfing, kayaking, sailing, sports fishing or diving to discover the diverse marine life. We suggest a visit to the National Marine Park Las Baulas, a reserve that has a great variety of birds and six known species of mangrove. In addition, Playa Grande is one of the most important places for turtle spawning so it is worth a visit. Overnight stay in Tamarindo.